Each man has by now inevitably chosen a favorite "turning point," at which he locates the origins of President Kennedy's new course. Mr. William F. Buckley has, typically, already assigned this honor to the Case of the Lost Postcard, which erupted at Harvard in the last week of June. I would not myself agree. That unfortunate Nigerian student was, after all, only stating his candid impression of the disconcerting affluence all about him, and there is little reason to think he meant to cast any aspersion on America's moral and spiritual values, as the 1,500 Harvard men, in conclave assembled, indignantly charged. I find it difficult to believe that the motive behind this affair was anything but frivolous, or that--as has been suggested--the President lurked in the background as alumni adviser. Never mind. It is surely the part of good sense to begin with the happenings of August 13 themselves. "It has come to my attention that unauthorized personnel have begun construction of a wall through the city of Berlin. Such a wall, I am informed by competent experts, would dangerously impede the flow of vehicular and pedestrian traffic. I have therefore instructed our armed forces to supervise its demolition." The stupefaction that this note produced in the chancelleries of the world was predictable enough. Requests for "clarification" poured in, but were returned with the curt comment the President was reading Norman Mailer's latest book and did not wish to be disturbed. In the 48 hours that followed, world opinion made itself heard. Prime Minister Macmillan, while stating categorically that Her Majesty's Government yielded to no one in its dedication to the unrestricted movement of traffic, reminded the House of Commons that he was an old soldier with an utter detestation of war. John Osborne and Kenneth Tynan wrote a joint letter to the Daily Express, resigning from the human race. In Paris, General de Gaulle was heard to remark acidly that President Kennedy's note represented a step backward, in that no reference was made to the free flow of men on horseback. L'Express published, in 675 pages, the first part of a longer essay by Jean Paul Sartre which demonstrated that the Existence of the Berlin wall was absolutely essential. Mr. Nehru, in an urgent communication to the Ford Foundation, deplored the use of violence against walls as an act of cultural barbarism. In Rome, Alberto Moravia, Sophia Loren and Carlo Levi issued an appeal, in the name of the dignity of mankind, to the conscience of humanity. Premier Khrushchev, at a reception for a delegation of peace-loving Indonesians, quoted the old Russian proverb about he who disturbs the peace being himself of a disturbed mind. He went on to remind his guests that, in the event of a thermonuclear war, capitalism would be destroyed, whereas Communism would endure even if every single Communist were killed. And on the morning of August 16, at 1:05 a.m., a string of non-explosive incendiary bombs liquefied the thousand yards of wall that had been constructed. Three slow-footed East German policemen were singed, as was one slow-witted American television comedian. I need not remind you how, in the days that followed, the world trembled in the shadow of ruination. The Secretary-General of the United Nations called an emergency meeting of the Security Council, the General Assembly and UNESCO. While the American delegation sat mute, their shoes on their desks, the Assembly worked frantically round the clock; at the end of the week, a vote of censure against South Africa was passed. Against this grim background, events in Berlin proceeded ominously. A new wall was begun, 500 yards back from the border, with the East German militia patrolling before it. On the night of September 3, an entire company of East German militia deserted to the West. Ditto on the night of the 13th. Immediately thereafter, Russian armored troops replaced the East German militia on patrol duty. They piled rolls of barbed wire along the frontier itself, and their tanks rumbled back and forth in the alley thus formed. When loudspeakers on the West Berlin side began broadcasting Russian language programs, loudspeakers erected on the wall began an incessant blaring forth of patriotic music. The ensuing din could be heard for miles. When the West Berliners began to erect huge motion picture screens facing the Russian patrols, and the East Berlin authorities countered with smudgepots that sent up an effective smokescreen, the whole business seemed to be getting to be rather a farce. Until, that is, the night of September 22 when 200 miles southwest of Berlin, a full-mile stretch of the East German frontier, heavily mined and wired and blockhoused, was blown sky-high by the greatest underground explosion in history. "It is, or ought to be, obvious to all thinking men that the conditions of modern military and industrial technology are such as to make the sovereign national state a positive threat to human welfare and survival. It is true that in present circumstances, all hope for a world community is chimerical. But because we cannot do everything, it does not follow that we need do nothing. I am therefore inviting the member governments of NATO to enter into conversations with the US aiming at the establishment of a common market, common citizenship, and various common political institutions. "In the interests of further combating the evils of parochialism and provincialism, I have instructed certain agencies of this government to dismantle the so-called Iron Curtain. These instructions will remain in effect until such time as the Soviet Government shows a disposition to enter into negotiations in a spirit of good faith." The rest is current events. The negotiations now under way toward a Western Community have, of course, run into annoying obstacles, though it is to be hoped that the proposed stock-option plan for redundant politicians will have a soothing effect. As for the summit conference on the future of the Iron Curtain, it inches along at a pace that is sometimes disheartening. 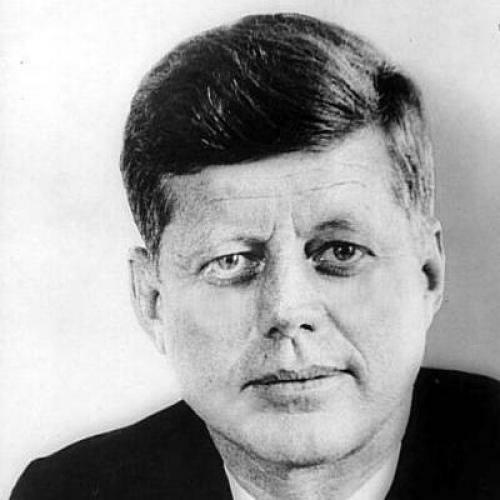 The Soviet delegates have, however, let it be known they appreciate the pressure President Kennedy is under from the war party of American capitalism, led by the Rockefeller-Meaney coalition. True, they were much troubled when the President casually remarked that Cuba was a bone in his throat, and that he was also rather irritated by Mali. But the consensus among their Whitehousologists is that, if he is handled with sufficient tact, the President might be persuaded not to raise these issues at this critical juncture.